Love and Company has given us a fresh and innovative approach to help us achieve success in marketing our new community. They have done an excellent job in helping us to capture our message and surpass our sales goals. Our relationship with Nakoma Sky began with marketing communications management, creative and digital services, and a significant update of their existing website. The new community’s creator, Posada Life, has been a well-respected non-profit organization in Southern Arizona since the mid-1980s. Nakoma Sky represents an expansion of their legacy, designed to be a Living Well community located in the heart of Oro Valley, Arizona. When complete, the community will offer independent living, assisted living and enhanced assisted living and memory support in a resort-style atmosphere. Love & Company partnered with industry-leader Greystone to lead marketing communications planning and implementation during the pre-construction phase for Nakoma Sky, which included refreshing their website, developing compelling creative and refining their brand position. Nakoma Sky wanted an effective way to relate their compelling story to age- and income-qualified prospects in the marketplace. The connection to parent organization, Posada Life, as well as the rich story of a brand-new community set in a truly beautiful location and infused with their Living Well philosophy, required a format that would allow the story to be told from different perspectives. 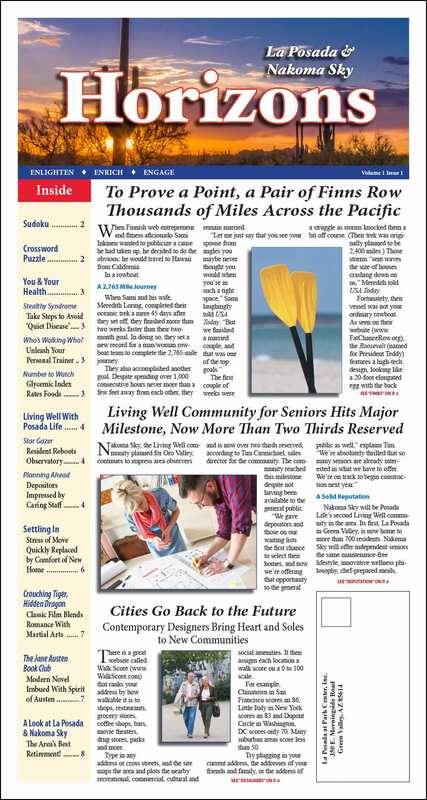 Love & Company worked closely with Nakoma Sky and their sister Posada Life community, La Posada, to create Horizons, a customized, branded eight-page newspaper that was mailed to age- and income-qualified prospects in the target market area. 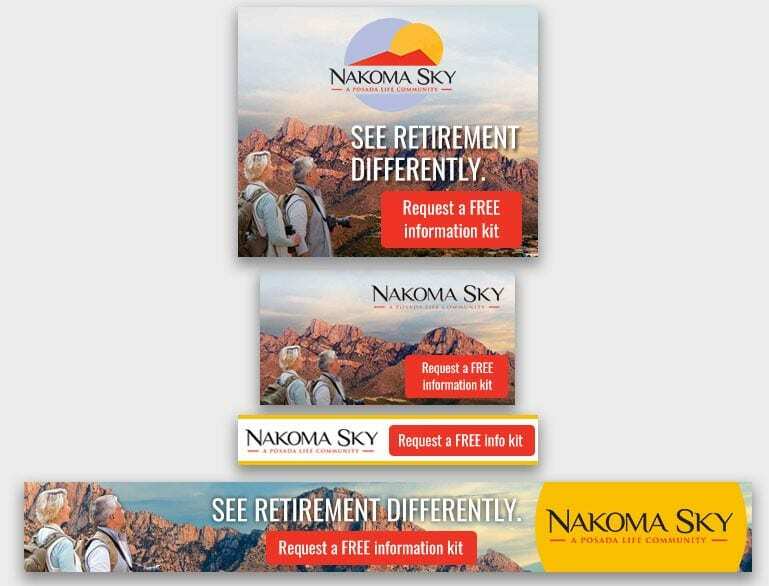 This powerful marketing and PR tool provided the space needed to tell Nakoma Sky’s story. By promoting their Living Well product and highlighting the community’s greatest competitive advantages, we were able to increase public awareness and generate new leads. We helped refine and optimize the Nakoma Sky website to best highlight the community’s many competitive advantages and to position it as a leader in the market, with special emphasis on the Living Well philosophy. The site’s responsive design and proven search engine optimization make it both easy to use and highly effective. Inspiring photos highlight distinctive mountain views and activities that reinforce the idea that where you live directly impacts how you live. 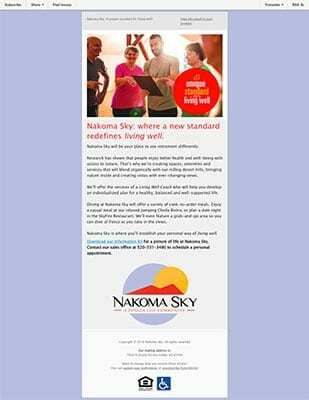 We translated the Nakoma Sky brand into a cost-efficient automated email program that helps educate prospects on the Living Well community and its foundational philosophies. 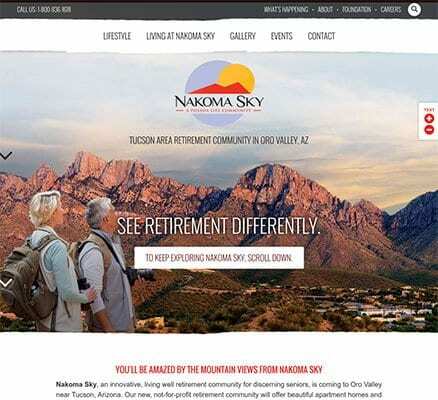 The story in the email series weaves in Nakoma Sky’s unique lifestyle offering, highlighting the stunning location at the foot of the Catalina Mountains, as well as the innovative services and the financial security found in a continuum of care. The response rate for this email series topped industry benchmarks, and was one tactic in an overall lead generation strategy that proven successful. This ad illustrates one of the fundamental aspects of the Nakoma Sky brand. 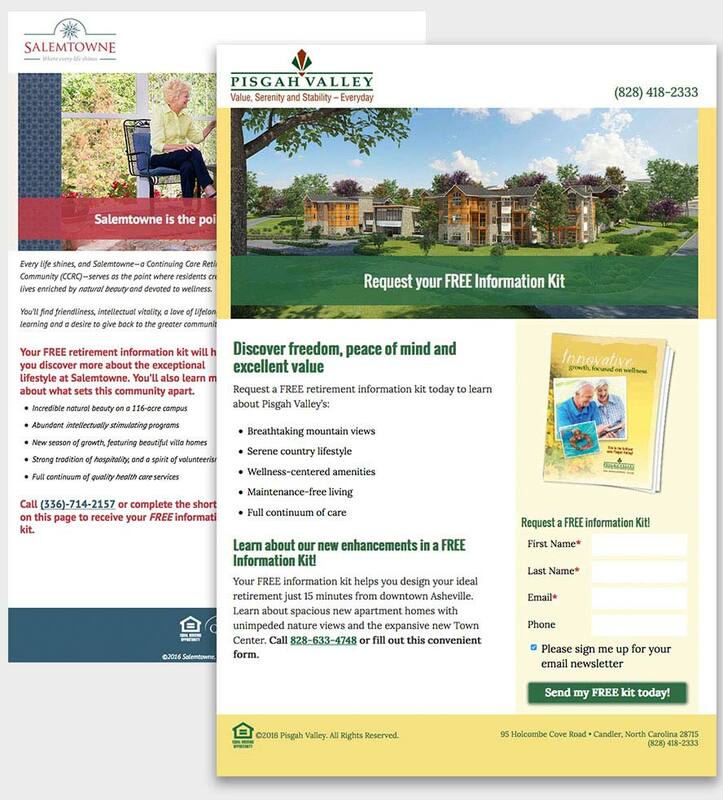 Appearing in local publications, this and similar ads helped establish the community’s unique commitment to living well, and demonstrated what area seniors can expect when they become residents of the community. Love & Company was hired in early 2016 to lead marketing communications planning and implementation during the pre-construction phase. A strong, collaborative partnership with the Greystone and Nakoma Sky teams led to the community reaching 75% reserved during the 10% depositor phase, a full 6 months ahead of the planned schedule.